Vancouver, B.C. November 13, 2018 — Ascot Resources Ltd (TSX.V: AOT; OTCQX: AOTVF) (“Ascot” or the “Company”) is pleased to announce that it has completed a 13,500-metre induced polarization (“IP”) survey consisting of eight profiles. The survey identified multiple high priority chargeability anomalies. Derek White, President and CEO of Ascot Resources commented, “We are extremely pleased with the results of the IP survey. The high-resolution survey consists of over 20,000 individual data points and the chargeability and resistivity inversions outlined a minimum of 12 new targets. 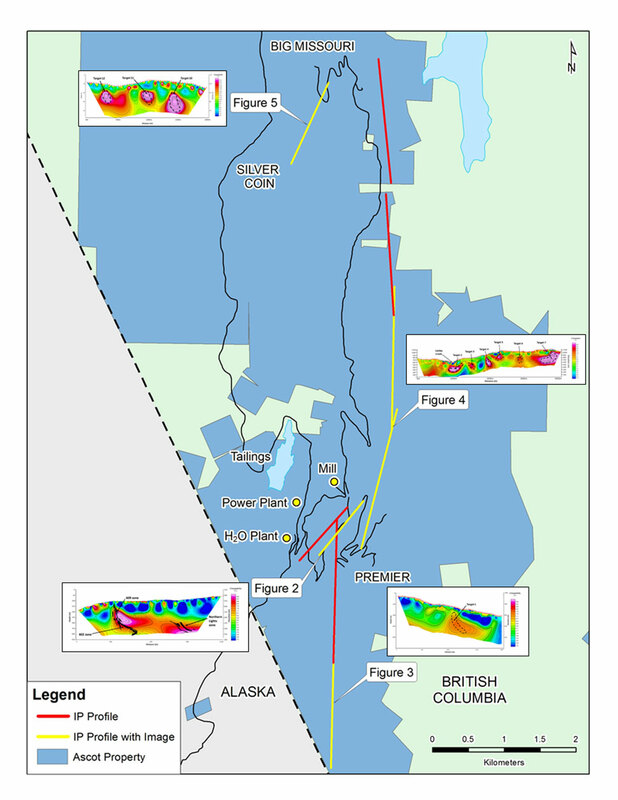 This geophysical technique is an extremely useful tool for Ascot in rapidly identifying drill targets for discovery of previously unknown gold mineralization on the property. These highly encouraging survey results will be followed up in next year’s field season by additional geophysics and drill testing of priority targets. We now see a clear path to organically add to our resource inventory through exploration and discovery”. 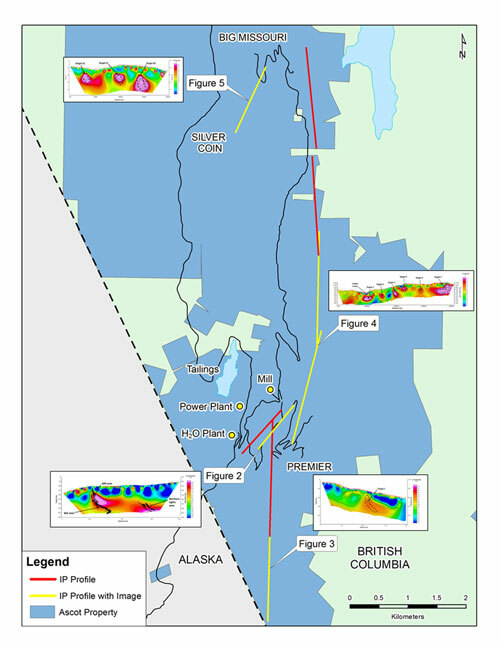 Following the successful IP test survey over known mineralization at the Premier/Northern Lights resource area (see Figure 2 and refer to the news release from September 6, 2018), the Company laid out a number of profiles spanning the southern two thirds of the property. The survey covered the distance from the Alaska border at the southernmost end of the property to the Big Missouri Ridge in seven north-south trending profiles (see Figure 1). After the acquisition of the Silver Coin property, an additional profile was added in the gap between Big Missouri and the Silver Coin prospect. The northern third of the property was not covered by any IP profiles at this time. The image in Figure 2 shows the final inversion results from the initial test profile over known mineralization. The results from this profile establish the signature of gold mineralization in the area and can be used to identify exploration targets in other parts of the property. The new profiles identified numerous areas with chargeability signatures that are very similar to that observed in the test profile. The survey identified an anomaly approximately 2,000m south of Premier (see Figure 3), and multiple anomalies to the north of Premier (see Figure 4). The profile between Silver Coin and Big Missouri outlined an additional three anomalies (see Figure 5). These new anomalies will be ranked by technical merit, ease of access and proximity to existing resources and will receive follow up priorities in accordance to the ranking. A single geophysical profile provides an initial indication of the presence of anomalous zones but contains little information about strike and dip of each individual zone. It is relatively unusual to see clear indications of dip and dip direction as can be observed at the test profile (see Figure 2). In order to develop these new anomalies into drill targets, the Company plans to run parallel IP profiles in order to determine the strike of the anomalous zones, followed by 3D grids over the anomalies with the highest priority. The additional geophysical work is scheduled as soon as weather permits in the spring of 2019, followed by drill testing of the most promising targets later in the year. Figure 1 Location map of the southern part of Ascot’s property showing the layout of the IP survey discussed in the text of this release. The location of chargeability profiles shown in this release are marked in yellow on the map. Figure 2 Inversion section of the chargeability along the test profile at Premier/Northern Lights (see Figure 1). The red and pink colours show areas of high chargeability caused by disseminated pyrite in the rock. The black shapes are the soft outlines of the May 2018 resource estimate superimposed on the chargeability section. The image demonstrates the spatial association of high chargeability with known gold mineralization. Figure 3 Inversion section of chargeability in the area to the south of Premier (see Figure 1) showing a previously unknown anomaly. The absolute chargeability is a little less (7mV/V versus 10mV/V) than observed at Premier but the geometry of the anomaly is strikingly similar. Figure 4 Inversion section of chargeability in the area to the north of Premier (see Figure 1) showing multiple previously unknown anomalies. Many of these anomalies are of similar strength and character as the anomalies generated from known mineralization at Premier (see Figure 2). The northern end of this profile (not shown here) contains an additional two anomalies. Figure 5 Inversion section of chargeability in the area between Big Missouri and the Silver Coin deposit (see Figure 1), showing three previously unknown anomalies. The absolute chargeability of these anomalies is higher than observed at Premier (20mV/V versus 10mV/V) which is likely due to the presence of more disseminated pyrite associated with sericite alteration in this area. This has previously been observed in drill core. The Company is also pleased to announce that an investor conference call with President and CEO, Derek White will be held on Tuesday, November 13, 2018 at 1:15 pm Pacific time and 4:15 pm Eastern time. Lars Beggerow, VP Geoscience and Exploration will co-host the call with Mr. White and will discuss the IP Survey in further detail.A presentation will be available on the Ascot web site at www.ascotgold.com. A question and answer period will follow the presentation.